The following npc's are those that are the major forces of evil all of which you will face during your game (except for one which you cannot face). Attributes: Good combat skills, High Intelligence, Wisdom and Charsima. 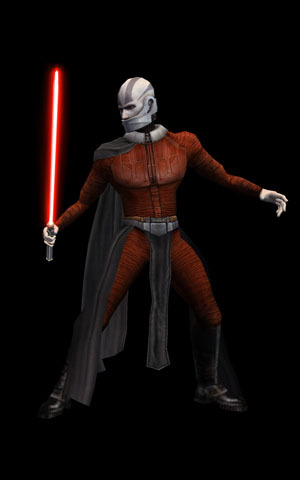 Darth Revan is the only enemy here that you cannot face, as Malak had betrayed Revan prior to the beginning of the game (amongst other reasons). 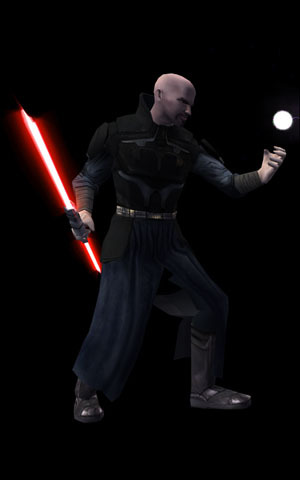 Little is known about Revan, besides his very powerful command of the force and his exceptional skills as a commander. 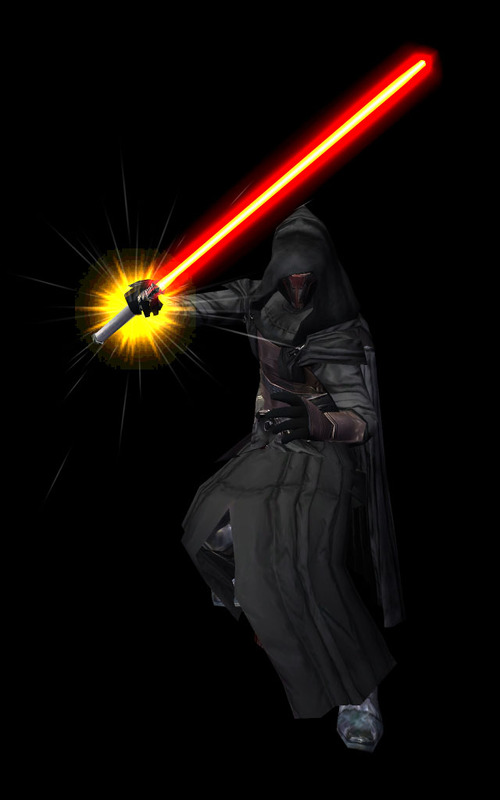 Revan is important in many ways, and you will learn more as you progress forward in the game. Revan's powerful influence is still seen for the Republic is in severe turmoil due to the armies of the Sith that have decimated their worlds. Equipped with: Dark Jedi Master Robe, Nerve Amplifier Belt, Malak's Lightsaber (special). Saves: 17 Fortitude, 12 Reflex, and 13 Will saves. The official Big Bad, this guy is one tough cookie. Weaker than Revan but still plenty powerful he is far more violent and aggressive than his former master ever was. While Revan used strategy and tactics to win with minimal fuss, Malak seems far more bent on the utter destruction of the republic. You will face him twice on your journey, the first time with him at a mere level 13, the second with him at level 20, with more feats than possible, though he will have fewer force points and force powers than he ought. Fortunately I have never seen him use Master speed, which decreases the difficulty somewhat. You will need good equipment and a decent build to take this bad boy down. While it is possible to take him down with a mediocre build it can be very difficult. For more specific information on how to defeat him, look at the the walkthrough on the Leviathan or the Star forge. Equipped with: Calo Nord's Battle Armor, Verpine Prototype Shield, and Mandalorian Heavy Pistol x 2 (drops them on Tatooine & Korriban). Also has Nerve Amplifier Belt and Retinal Combat Implant on Tatooine, but doesn't drop them. Has three Thermal Detonators and three Concussion Grenades. Feats: Has the following feats on every planet: Improved Power Blast, Improved Sniper Shot, Master Rapid Shot, Master Conditioning, Proficiency All, Weapon Focus and Specialization in all weapons (including grenades and simple weapons). Has two-weapon fighting on Kashyyyk and Tatooine. Skills: Demolitions 4, Awareness 13, Repair 4, Treat Injury depends on planet, from 9 to 15. Saves: Depends on planet from no bonus on Manaan, to +8 to all saves on Kashyyyk. This bounty hunter is the first of the bad guys that you get to meet, and his stats vary wildly depending on which planet you meet up with him. When you first meet him on Taris you can fight him if you wish but that means instant death. The second time you bump into him, he's been toned down and can now be taken down, though not killed. The third and final time you face him will be after you see a cutscene of him talking to Malak, and then after you get the next star-map (or if on Korriban once you enter the Valley of the Dark Lords). If you face him while still at a low level he can be difficult, especially since he has a Verpine Prototype Shield to protect him from tons of energy damage. Your best bet may be to have a melee weapon in hand to take him down rather than lightsabers. Technically he's probably easiest to face on Manaan, but I still prefer facing him on Tatooine as it fits the story progression better. It is probaly best to focus all your efforts on taking him down first, as he can inflict far more damage than his goons. If you have Force Whirlwind or any of the choke line of force powers, that may be a good choice to cast on him to prevent him from causing too much damage, as well as debilitate him. One thing to note that on Tatooine he is immune to both Sneak Attack damage and Critical hits as well as mind affecting powers, which means that you don't want to use Critical Strike or powers like Horror (stasis still works). While he is Darth Malak's official apprentice this guy is not as tough as he looks, at least by the time you get to him, which is sort of a disappointment for being the big bad guy's apprentice. Sure he's a complete jerk, but that doesn't make him much more powerful than the other dark Jedi you've been facing up to this point. While his large FP total can be annoying, it shouldn't be too much trouble as all of his force powers are relatively weak. The only one that may give you trouble is Death field, as that can harm your entire party while healing him for large amounts of VP. If your party attacks him with all they have he should go down without too much trouble. Once down to less than half his VP however if you don't debilitate him or take him down fast enough however you can be in for quite a fight as he will use death field continuously. Ignore his minions as they are really pathetic. An interesting thing to note is that you cannot modify his "special" double-bladed lightsaber and is therefore of no worth (he sometimes drops this). For the easiest fight take him out on Tatooine, as you can buff your party beforehand, and he has the weakest saving throws, feats and force powers. Equipped with: Heavy Battle Armor, Verpine Prototype Shield, Sith Assassin Pistol (Special). 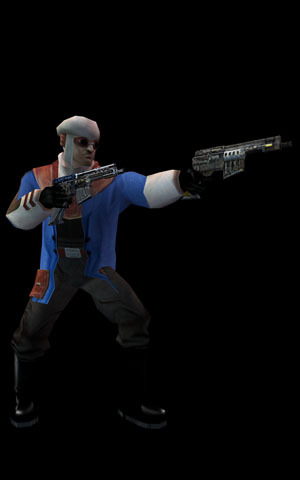 While Carth's old mentor, Saul himself is a complete pushover, the battle is not so easily won for the main reason that when you face him he is surrounded by a horde of allies, many of whom have plasma grenades. Force powers that do area damage are the most effective here, try to mop up the weaker Sith soldiers first as they are the ones with the grenades. You may even want to lob some grenades of your own. Guardian's force leap is great here for getting out of the way of the grenades thrown. 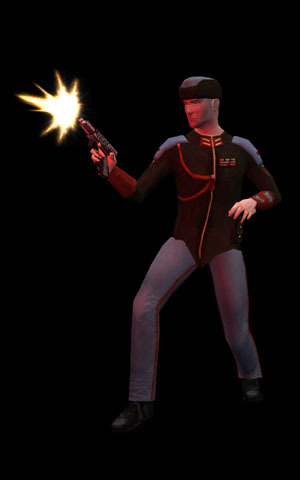 Just make sure to loot his corpse for a very special gun, Saul's Sith assasin Pistol, which happens to be the most powerful pistol in the game.